Economy - overview: The agricultural sector accounts for about one-fourth of GDP, two-thirds of exports, and half of the labor force. Coffee, sugar, and bananas are the main products. Former President ARZU (1996-2000) worked to implement a program of economic liberalization and political modernization. The 1996 signing of the peace accords, which ended 36 years of civil war, removed a major obstacle to foreign investment. 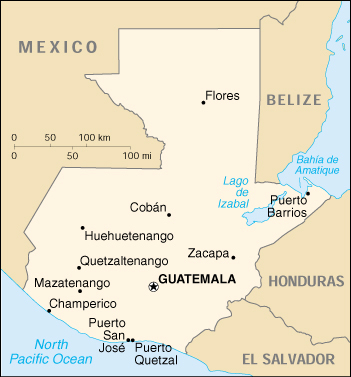 In 1998, Hurricane Mitch caused relatively little damage to Guatemala compared to its neighbors. Ongoing challenges include increasing government revenues, negotiating further assistance from international donors, and increasing the efficiency and openness of both government and private financial operations. Despite low international prices for Guatemala's main commodities, the economy grew by 3% in 2000 and is forecast to grow by 4% in 2001. Guatemala, along with Honduras and El Salvador, recently concluded a free trade agreement with Mexico and has moved to protect international property rights. However, the PORTILLO administration has undertaken a review of privatizations under the previous administration, thereby creating some uncertainty among investors.